Red tide continued to plague Anna Maria Island and the surrounding waters in fits and starts. A beach that was clear with turquoise waters in early morning, was often a shoreline riddled with carnage by late afternoon. Pockets of the harmful algae bloom continued to appear and shift in the Gulf of Mexico and Sarasota Bay the week ending Aug. 24, with the Florida Fish and Wildlife Conservation Commission reporting red tide reaching Pinellas County and into the mouth of Tampa Bay. An enlarging bloom was stretching farther offshore than in prior weeks since the HAB reached Anna Maria Island Aug. 3 in high concentrations. The stench of rotting dead fish that lingered over the island for two weeks reached inland as far as downtown Bradenton Aug. 23. The Manatee County Board of Commissioners declared a state of emergency Aug. 21, a necessary move to tap into disaster aid. 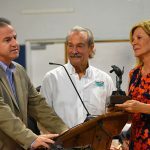 Officials announced Manatee County would receive $750,000 from the Florida Department of Environmental Protection for cleanup efforts. Charlie Hunsicker, Manatee County Parks and Natural Resources director, likened the fish to sand dunes rolling in across the Gulf. He took a helicopter ride to assess cleanup priorities and saw pools of dead fish 40-50 feet wide in the offshore waters of Manatee and Sarasota counties. On Aug. 21, Gov. Rick Scott requested federal Small Business Administration help for those impacted by red tide and he requested the SBA issue an additional Economic Injury Disaster Declaration for Manatee, Sarasota and Lee counties to enable low-interest loans. 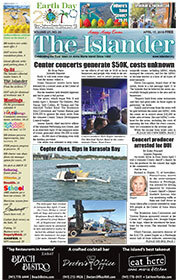 Local chambers of commerce advised people to document and detail business losses during the red tide crisis. Meanwhile, a grass-roots effort to support local businesses grew, gaining attention with events and meet-ups promoted on social media. Local-for-local discounts and specials were the new buzzwords at island eateries and bars, some with all-day happy hours and red tide specials. In a joint collaboration including restaurants, the Sandbar Restaurant hosted a “Long Table Dinner on the Beach” Aug. 26, with dishes from the Sandbar and island eateries, including the Anna Maria Oyster Bar, Blue Marlin Seafood Grill, Seafood Shack Marina Bar and Grill, Swordfish Grill and Tiki Bar and the Waterfront Restaurant, and the Dry Dock Grill on Longboat Key. Proceeds from the dinner went to Mote Marine red tide research and START/Solutions to Avoid Red Tide. Meanwhile, volunteers continued cleanup efforts. On Aug. 22 alone, volunteers helped remove 3,000 pounds of debris from Manatee County beaches. Inmates from the Manatee County jail worked in the beach cleaning as part of a work-to-lesson sentence program. 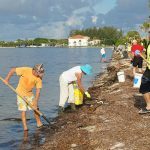 The total amount of dead and decaying fish removed from Manatee County waters was estimated at 164 tons as of Aug. 21, with cleanups continuing daily.